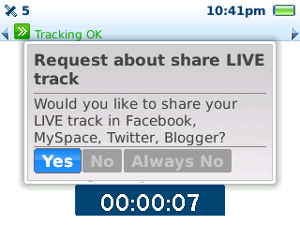 Record tracks of your trips anywhere on the Earth from your BlackBerry. Share GPS tracks and geotagged photos with friends via email, IM or by posting them to social networks like Facebook?, MySpace?, Twitter? and Blogger?. Let your friends see your instant position on a map!